Before we proceed with our discussion on “Safety Measures to be incorporated in a Retail Store Design”, we will just take a brief look at out earlier discussions on the Retail Store Design. How “Form follows Function in a Retail Store Design” and it relates to every aspect in our design. The basic design thumb rules of designing any space stay the same: safety and protection should never be overlooked. Many a time, these factors are negated or given second place, depending upon the commercial utilization and viability of that particular space. These important factors should be taken into account right from the drawing board phase of the design. This would help integrate safety factors within the design and planning, and create a design output that is captivating and yet responsible. Services play an important role, not only in maintaining the image of the store but also in acting as a factor for safety and protection. A well planned, well designed retail outlet should have best quality services available. Automation is the key requirement for retail spaces which involves CCTVs, access control systems, IP cameras, burglar alarms, smoke detector panels and water sprinkler systems. The gap between the quality and standard of design seen in Developing countries and that seen in Europe and America is fast diminishing. Thanks to globalisation and professional competition, the quest for a world class design output is seen in every facet of designing; be it architectural design, interior design or product design. In terms of retail spaces, many international brands have a unified design code across all outlets and thus manage to achieve the same quality of design output globally. 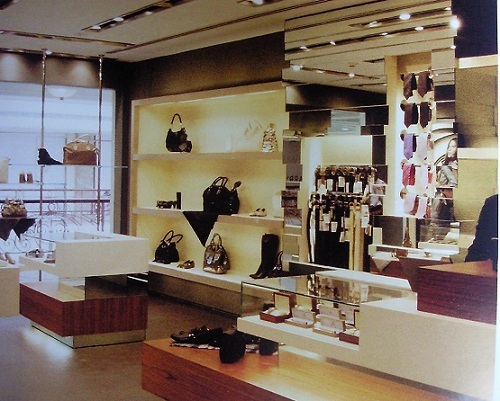 The Indian retail client of today realizes the need for a high quality distinct design to his retail outlets. This results in encouraging the design offerings that interior architects and designers create for the local markets. This entry was posted by Benzu JK on August 9, 2010, 9:36 am and is filed under Design Guide. You can follow any responses to this entry through RSS 2.0. I never considered how much work goes into designing what look to be just simple retail outletsd. Thanks for sharing this glimpse into the other side.